Digital two-way radios can make a big difference in how your business communicates. They offer better coverage better audio, individual calling and a host of other innovative features. Finding out how digital radios can benefit you has never been easier with this incredible promotion from Hytera – the global leader in digital radios! For a limited time, we are offering qualified businesses in Minnesota the opportunity to receive and try TWO Hytera digital two-way radios absolutely free. We’re so sure you’ll love them, there are no strings attached. Use them and see how digital can perform for you – AND – you never have to give them back. 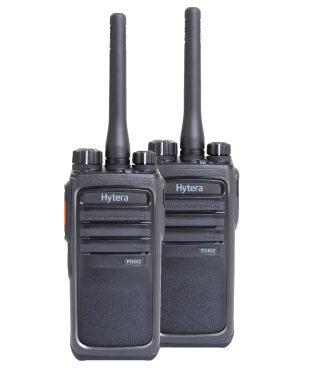 Hytera radios are compatible with most radio systems including analog and Motorola digital radios. Thank you for your interest in trying (and keeping) Hytera digital two-way radios for free. Please fill out the form below and click “Apply Now” to submit your offer request. You will be contacted by a PWC representative within 2-3 business days. Do you currently use two-way radios for your business? If yes, what brand and model are you using? How many people use two-way radios in your business?